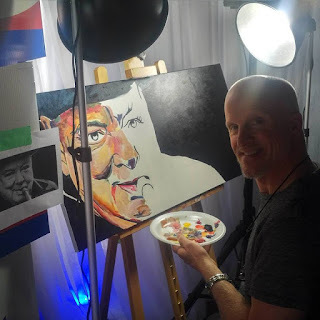 Last night I had the pleasure of painting in front of a large crowd at a fundraiser for my friend Don Scott's mayoralty campaign. Next to me was another friend, Dan Gillies, playing guitar throughout the evening. The combination of an energized crowd and Dan's music was a sweet elixir for putting painting on the canvas. It is hard to describe, but when there are all these amazing things happening in a given space, my brain gets distracted just enough to allow things to flow in a way that is hard to replicate in the quiet studio. Colours seem to mix in a more interesting way, brush stroke choices are made that work, and the piece magically comes together in just the right amount of time. I'm grateful to Dan and his artistry. This was the third time we've painted in the same space, although only the second time we were physically right next to one another. The physical proximity enhances the interchange of music with the art. The fundraising dinner event attracted a sold out crowd at Asti Trattoria Italiano. I played three different roles - a new first in my growing list of live painting variants - I painted, emceed and auctioned. Now, to be fair, I didn't really want to be the auctioneer for the live auction portion of the evening. This is not a skill that I possess, though I try really hard to emulate some the great auctioneers I have heard in the past. The fact is that I couldn't sucker anyone else to come up and do it. For the first time, I found myself auctioning off a painting that I had just completed. God bless Brad Lucier and RJ Steenstra who got into a bidding war. Together, they drove the price up to $3,250. I was thrilled. The winner was Brad, who said that he will be hanging it up in his HVAC Solutions boardroom. Before that happens, he will pick a Winston Churchill quote that I will add to the piece. "You're a big part of this painting," I said to Dan Gillies before leaving for the night. I'm convinced that the colour choices and the intuitive choices that were made were influenced by the music he was playing. The interchange of music and art was alive and well.